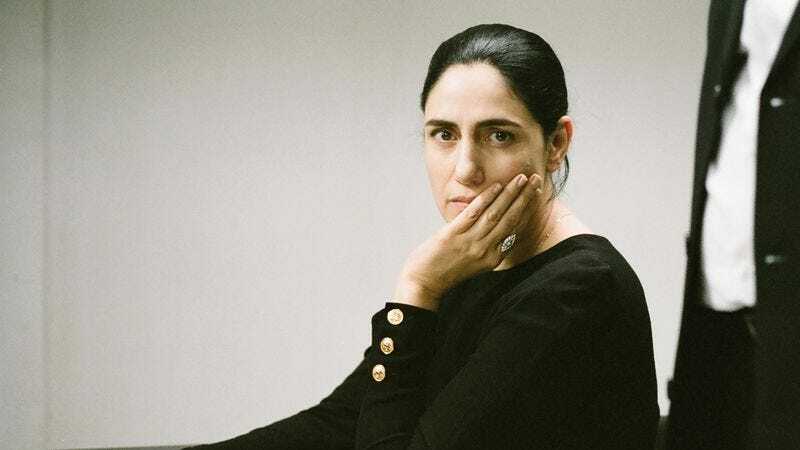 Viviane Amsalem (co-writer-director Ronit Elkabetz) wants a divorce. She’s been stuck in a loveless marriage to the devout Elisha (Simon Abkarian) for many years. (The characters appeared in two previous films, 2004’s To Take A Wife and 2008’s 7 Days, by the same brother-sister filmmaking team). But Israeli law, a patriarchal system through and through, is not on her side. It’s telling that the movie, which takes place entirely in a dismayingly nondescript courthouse, keeps its female lead visually offscreen for several tense introductory minutes, during which the camera assumes her POV and focuses on the men who will fight for or deny her right to dissolve a union that has long since stagnated. There’s Viviane’s devoted lawyer, Carmel Ben Tovim (Menashe Noy), arguing for her independence even as he continually casts worried glances toward his client. (It’s apparent they face an uphill battle.) There’s Elisha, sitting calmly but defiantly at the defendant’s table, plainly prepared to not give an inch in his belief that this marriage is forever. There is the trio of stern-faced rabbinical judges who require much more than a woman’s desire to split from her husband as grounds for divorce. And there is Viviane herself, finally seen in a stunning side-profile shot, clearly dejected but determined to see the dissolution through to its (ultimately not-so-happy) end. This setup might remind viewers of Iranian writer-director Asghar Farhadi’s awards-bedecked drama A Separation (2011), though the story beats here are much more conventional, very Law And Order in how the Elkabetzes dole out surprise accusations and impassioned soliloquies whenever their narrative needs a goose. This isn’t particularly a problem considering the overall structure of the piece: Each new scene takes place weeks, if not months, after the previous one. On-screen titles mark the passage of time like journalistic datelines and the sheer moral and spiritual exhaustion of the characters becomes more and more palpable as the case drags on for an absurd length of time. This all might be laughable if it wasn’t based on the very real facts of the Israeli court system, which as portrayed here is like Kafka without the surrealist trappings. 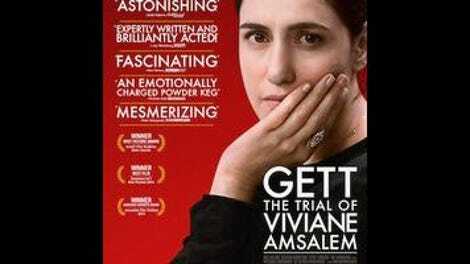 All the performers are superb, though as the title suggests, this is Viviane’s show, and Ronit makes for an exceptional martyr (she gets a Passion Of Joan Of Arc-worthy close-up or two) who never loses her very human shadings. In one of the most powerful scenes, she openly and regretfully admits to being unable to provide the best home for her family, at least as far as the current societal strictures stand. None of Viviane’s antagonists are demonized. The world they all live in is the way it is. That doesn’t mean it should stay that way.